Thats Ruff! : Reflections from Grouse Country. This is one of the original patches for the Ancient and Honorable Order of Brush Worn Partridge Hunters. Since I started bird hunting over fourteen years ago, I have naturally gravitated towards grouse—any kind of grouse. In Idaho we have five species, Ruffed, Dusky, Sharp-tailed, Sage, and Spruce grouse. I love every one of them. I love everything about grouse: their environs, their beauty, their thunderous flushes, and the thrill of taking one on the wing over my Brittanys. They are the essence of wild. While I pursue and enjoy other game birds, I am first and foremost a grouse hunter and forest grouse (i.e. dusky and ruffies) are my favorite. Over the years, I have collected and read many books on ruffed grouse and grouse hunting. Some were great and some were so-so. My favorite bird hunting author is none other than the Poet Laureate of ruffed grouse hunting himself, Burton L. Spiller. Very few other writers capture those special little details, experiences, thoughts, and feelings of a grouse hunter like Spiller. I just read for the second time, That’s Ruff! : Reflections from Grouse Country, by George King. The first time I read this book I absolutely loved it. In fact, I felt it was so good that I have wanted to do a book review ever since, but I was just not sure if I could do it justice. So I drug my feet. Upon the second reading, I decided it was time to say my peace about That’s Ruff! In my humble opinion, George King is the best writer on ruffed grouse hunting since Burton L. Spiller, and I mean to take nothing away from great writers like Tom Huggler, George Bird Evans, Tom Davis, Ted Nelson Lundrigan, Robert F. Jones, Steve Mulak, or Bill Tapply, etc. whose writings I’ve thoroughly enjoyed. However, since Spiller, no one has fully captured the essence of the grouse hunter—or “Brush Worns” as King calls them—and the experience of grouse hunting, as well as George King. Like Spiller’s work, this book embodies a lifelong affair with the ruffed grouse and grouse hunting. At times, this extremely well written book is sentimental, funny, serious, sad, but never sappy. Time and again as I read through King’s stories, I was struck by how similar his experiences and thoughts were to my own. 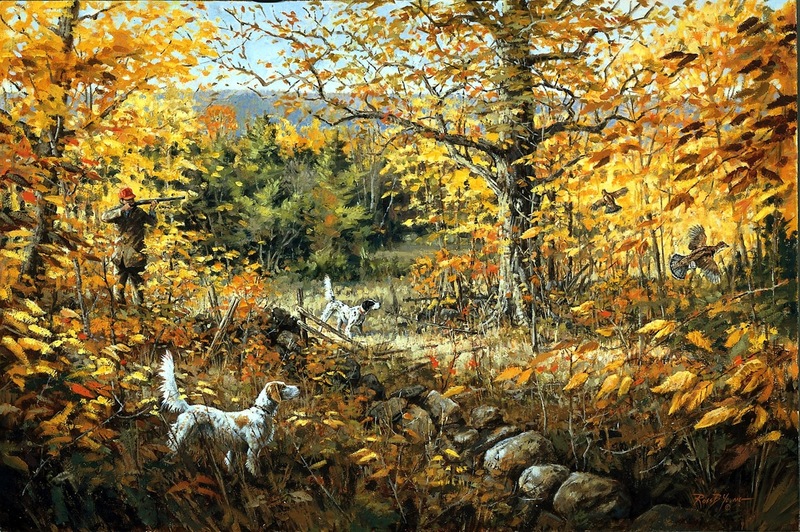 King accurately captures so many aspects of the hunt that anyone who has pursued the noble ruffed grouse can’t help but relate. Is to shoot when you can and then hollerschidt. King’s poems and stories alone are worth the price of admission, but the book also lets you peer into the past to learn more about other great outdoor writers including Tap Tapply, Frank Woolner, and Burton Spiller himself. King knew and communicated with these iconic men. In fact, King was instrumental in the reprinting of Spiller’s classic books, Grouse Feathers and More Grouse Feathers. But for King’s efforts, these books would not be readily available to our generation of grouse hunters. I found it very enjoyable to get to know these great men a little better through their letters and King’s recollections. Amazingly, as King relates, Burton Spiller was so unassuming that he believed he was a nonentity and he really had no idea of the impact he has had on those who read and treasured his books. One of the things that I like best about King as a person is that he is equally as humble as Spiller. I was impressed to learn that King was the founder of the Grouse Cover newsletter which he started in 1969 and continued until 1973, when he had to quit because of a personal illness. 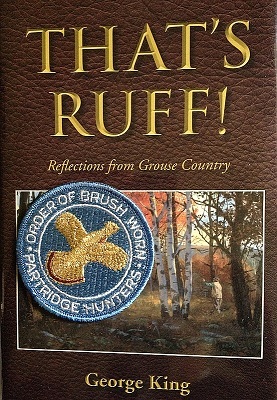 In That’s Ruff!, we learn about this newsletter and how it spread like wildfire to obsessed ruffed grouse hunters who were hungry for anything grouse and grouse hunting they could get their hands on. As you read the excerpts from this newsletter, you can see how it easily filled the void. This newsletter brought together grouse hunters from all over the country and allowed them to share in their unique identity and to commiserate in their incurable addiction. In fact, the subscribers requested that King create an organization of which they could all be a part. Pursuant to this request, King created the Ancient and Honorable Order of Brush Worn Partridge Hunters (or “Brush Worns” for short) and when a person subscribed to Grouse Cover, they were issued a certificate and also could order a patch showing they were officially a Brush Worn. To my understanding, after almost 40 years, Brush Worns still exhibit their certificates and patches with pride. I want some of those for myself! Does that sound like any birdbrains that you know? Shoot, I want to be part of such a great group. So many years later and I already feel as if I belong. And this group of crazy Brush Worns came together because of the efforts of King. Yet King never brags or seeks attention or personal praise for this accomplishment. “Old Gate Ruffs” by Ross B. Young. You can see more of Ross’s excellent work at http://www.rossbyoung.com. The grouse, to the grouse hunter, is the very spirit of all the things around him – the breath of life in rocks and trees and fallen leaves, in fragrant bogs and mossy logs and mountain tops. I don’t know if the Lord made the grouse to fit the cover, or the cover to fit the grouse, but whichever it was, He must surely consider the result to be among His finest work. On the top of a mountain, the air is fresher, the sky is bluer, the wind is stronger, a man is taller, and sunsets last longer than anywhere else on earth. I hope I don’t find out someday that heaven isn’t “up,” for if that’s the case, I’ve spent a lot of time on mountains thinking it was closer than it was. It seems to me that any man who loves the grouse would have to love a dog, for these are two of his Makers finest creations. And though they are our favorites, they please us in exactly opposite ways: one the very essence of all things wild and free—the other the embodiment of loyalty and service. And now, in those brief few moments of the point, they are linked by a tenuous thread of scent, and primal instincts that neither of them can fully understand. Amen. What more can I say? George King has truly been there and has captured so succinctly the bird, the covers, the dogs and the sport we so intensely love. Mark my words, this book is a sporting classic and will go down in history as one of the greatest upland bird hunting books ever written! Thanks for finishing this lifelong project, George. The first printing of this book has sold out. However, Dale Dalrymple at Dale’s Decoy Den also loved the book so much that he helped the author obtain a second printing. Therefore, the book is again available through www.dalesdecoyden.com. I highly recommend this book to all who love hunting the noble ruffed grouse. Also, for $10.00 you can also order your own BrushWorn patch, but you’ll have to beat me to it!!! Thank you, Rob. This book is the finest book on bird hunting written in a long time!